If you are interested in improving your local SEO performance, then gaining consistent business citations is an absolute must. Get Me Everywhere Plus, or GME Plus for short, is a business citation service that submits your business name, address and telephone number (NAP details) to the business citation websites that leading search engines (such as Google) care about. When the search engines see that your business is mentioned consistently online, they interpret this information as a sign of quality. And since search engines care about serving up accurate information to their users, your business will enjoy a boost in local search verticals such as the Google Local Pack. To find out more, call us on 03330 145 045. Lines are open between 9am and 5pm Monday to Friday. Or alternatively, drop us a quick email at info@thomsonlocal.com. Where do we submit your business citations? With GME Plus, we focus on quality over quantity to secure your place on the 15 most high-value citation websites available in the UK. This includes 192.com, Foursquare, Cylex-UK and Google My Business. Each of these citation websites has a high domain authority, which means they are likely to perform well on search engines. This authority is then passed down to the businesses that they list, giving you a boost in local search as a result. A Google My Business listing (GMB Listing) is more than just a business citation, it’s an essential part of getting your business to perform well in local search. Once verified, your business can then appear on both Google Maps and in the Google Local Pack for searches in your area. We will provide you with regular reports to show you the citation websites you are currently listed on and whether there are any inconsistencies in your business name, address and telephone number details. This means you gain the peace of mind in knowing that your business citations are in safe hands. I have been advertising with Thomson’s for over 20 years now and cannot speak highly enough of the service that I have had in that time. I have two web-sites with them and am very pleased with the appearance and the managing of the sites, not to mention the marked increase in enquiries. I have been advertising with Thomsons for the past 25 years. I have regular phone calls and emails from other advertising companies offering similar services to yourselves, I have tried some but do not get the same level of service or , the same results I achieve through Thomsons. I could not recommend Thomson Local highly enough for a new business or even an established business. They know what they are talking about and certainly stick to what they say and I for one know I will go nowhere else but Thomson Local for my online marketing. We have had a website with Thomson Local for 3 years and found it useful being able to monitor its success as our customer base grew. Overall we have found dealing with Thomson Local to be easy and helpful. It has definitely been beneficial to our company. At McKeown Fencing we have been using Thomson Local for many years. Over that time Thomson Local and the services they offer have been an important part of our marketing strategy. Through the development of our website, ensuring in ranks high in Google and our listings on their website we have been able to strengthen our position in our market place. 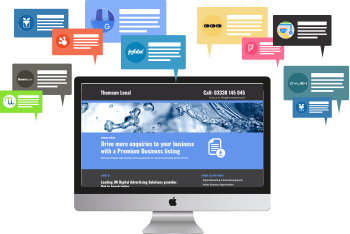 We use a range of their services including thomsonlocal.com and pay per click and not only do we find this effective but also good value compared to our spend. Recently we branched out business into a different sector and Thomson Local has given us a great platform in which to take a foothold in this market. We advertise on thomsonlocal.com under Burglar Alarms mainly in the Lewisham & Greenwich and Bromley areas. The products are truly helping our online visibility and generating quality business. We are extremely happy with the results from this digital advertising. I have been using Thompson Local on line services in the Lambeth area and found it to be excellent for potential customers to see us on line and to be able to contact us direct. Since signing up to Get Me Everywhere I have found the website traffic has gone up exponentially and customers will say that they saw a photo on the website or something similar when on the job. We never used to receive this traffic and practically since signing up this has given us a large amount of business. Simply complete the form, or give us a quick call on 03330 145 045. We’ll then put you in touch with one of our product experts to answer any questions you might have.